At what Centibar value should I be irrigating? At what depth should I install my IRROMETER, or WATERMARK Sensors per Crop type? How long do the sensors last? How can I check the sensors? How do I properly install the sensors? How does soil temperature affect the reading? Should the Irrometer be protected from freezing temperatures? What types of soil can I use WATERMARK sensors in? Can I read a WATERMARK sensor with a multi-meter? What does (insert your volumetric measurement here) equal in Centibars? Can I read a WATERMARK sensor with my device? Is the WATERMARK sensor a gypsum block? What soil characteristics affect the WATERMARK Sensor readings? Which wire is the ground wire on the 200SS? How many records will the 900M Data Logger hold? How can I update the firmware on my 900M Data Logger? My computer cannot connect to the 900M. My data logger is displaying "open" on the display. What are mesh radios or nodes? Will I need an installer? How long will these radios last? How does the data get to me? Why is the Base not wired to the data collection device ? What is the difference between Relay and End Nodes? Do I need to program anything? What happens if a link is missing - do I lose data? IRROmesh components don't have batteries - do they still work at night? How does a time-stamp get attached to the data? The radio's case doesn't look waterproof, can I get it wet? Do I need to buy custom mounting hardware? Do I have to use the SensMitWeb Service? Can I send the sensor data to other applications? How far can the radios communicate? How many radios can I have per Base? How close can radios be to each other? Do I need to install the radios to have clear line of sight? 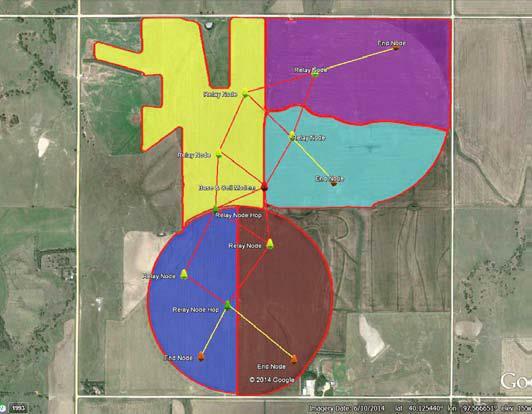 How many radios do I need per acre? Are the radio waves dangerous? Do I need a license for these radios? How many sensors can I connect? How long can the sensor wires be? Where can I view my data? or says that my mesh has not delivered any data yet when I know it has - what's wrong? Where do I get the Windows applications I need to send data up to the web? How do I use SensMitPath? How does SensMit connectivity work? My base runs low on power at night. I want to stream data from my Internet-enabled on-site facility -which data collection device do I need? How does PC Link work? I plugged in my PC Link but nothing is happening. I want to stream data from a remote location - what do I need to order? Which PC do I use for PC Link and Logger download? When should the Logger be used? How do I start my Logger? How do I download my Logger? My PC Link or Logger is properly connected and SensMitPath is running but it's not finding the device. My Logger has downloaded, so where is the data now? Why does my Data not get sent to the web as soon as it is collected - I have to wait as long as 10 minutes for it to appear? Can I change how often the data is collected? Can I send data to other applications? What does the sensor data mean? Where can I find an installation manual? What does an IRROmesh installation look like? How do I design my mesh layout? What does clear line of sight look like? What do 'Associate' and 'Join' mean in IRROmesh language? What do the light flashes of a Normal Node look like? No lights are flashing on my node - is it working? Do the nodes' solar panels have to be in full sun? How do I install my mesh? My node's lights are not flashing, or none of the mesh's lights are flashing - is something wrong? The whole mesh is awake but my Logger is asleep - is this normal? This node is getting lots of light - why is it not awake and flashing? What if I don't want to wait for light flashes to see if the system is reporting? How do I interpret what the diagnostics chart is telling me? How do I disassociate a node from its Base so I can use it with another Base? How do I add a new node or Data Collection Device to my system? How do I remove a node from a Base/mesh? How do I change to a new or different data collection device? Can I use a PC Link to stream data through 975L IRROmesh software? My Logger runs out of power. No data is getting to the website from my Cellular Gateway. I am seeing '500' series error messages in the SensMitPath window. All I get is a map of the world on the SensMitWeb map page. All my Nodes won't associate with the Base. How do I know my code version? Why is my mesh often asleep during daylight hours? Why does it take a long time for nodes to re-join the mesh? What if one or more nodes won't join, even though they are flashing and near enough to another node? Why does my node suddenly stop reporting? Birds are roosting on my nodes and droppings are obscuring the solar panels. My Logger is flashing green but no data is being collected. Why am I missing big blocks of data, or why is my data from Jan. 1, 2012? I've tried everything and nothing is solving my problem. "At what Centibar value should I be irrigating?" This depends on the type of crop and the type of soil it is growing in. There are resources available for most commonly grown crops that can give detailed information regarding recommended tension levels. 100 - 200 centibars = Soil is becoming dangerously dry for maximum production. Proceed with caution! Your own situation may be unique because of differences in crop, soils and climate. Perhaps the most important soil moisture reading is the difference between today's reading and that of 3 - 5 days ago. That is to say, how quickly is the reading going up. A slow increase means the soil is drying out slowly. But a big jump means the soil is losing water very rapidly. This tells you WHEN to irrigate. The trend can be more informative than the absolute values. "I don't believe the sensor"
As often as not, the truth is simply not what the user expects, but there are situations that can cause incorrect readings. Are multiple sensors correlating with each other? One problematic sensor/ installation may be possible, multiple problems are unlikely. Are the sensors responsive? 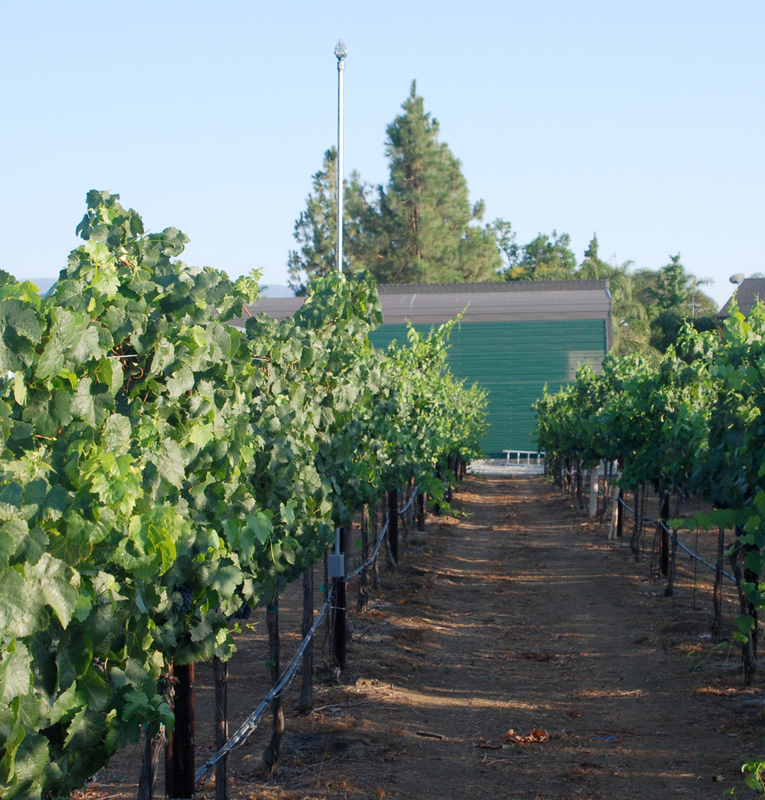 If the sensors are responding well to irrigation and drying as expected, there is no reason not to believe the reading. If the sensors are very unresponsive to expected changes in soil moisture, the sensor may need to be reinstalled. 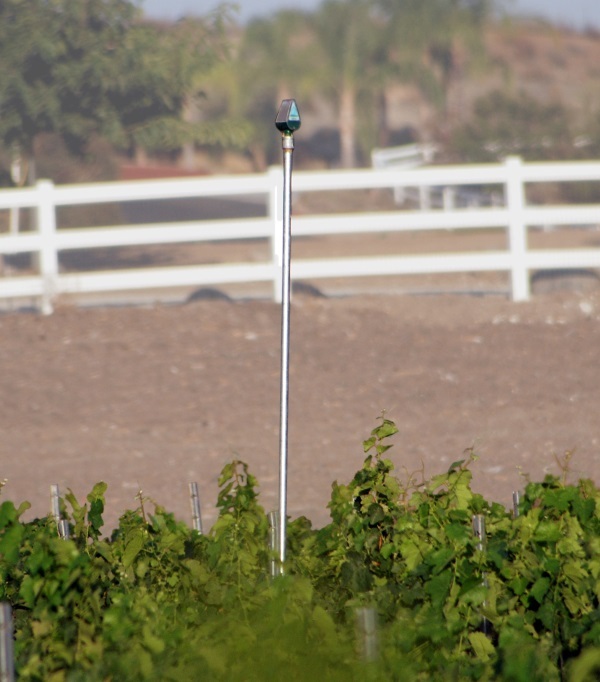 The WATERMARK sensor depends on a tight bond with the surrounding soil to absorb and release soil moisture. A poorly installed sensor can be just "sitting in the hole" with no ability to move water in and out of the granular matrix. Are the sensors in the active root zone? If the sensor is sitting on top of a rock, below a hard-pan, or outside of the area being accessed by the plant root systems, water movement can be impeded and the sensor will not accurately reflect the soil moisture available to the crop. Is the sensor installed in a heavy soil that has recently been dried out (80cb +)? Heavy soils can actually pull away from the sensor when they become very dry. This can cause the loss of connectivity between soil and sensor. Typically an irrigation event will correct this problem, but re-installation may be required in extreme cases. A constant "0" reading can indicate a short in the sensor wiring. If the sensor is at the end of a spliced wire run, try disconnecting the sensor from the cable extension (at the field side) and see if the reading is still "0". If so, there is a short in the wiring between the reading equipment and the sensor. Also see How can I check the sensors? A maximum dry reading can indicate a broken or poor wire connection. Typical culprits include bad wire splices, chewed or cut wires, wires pulled out of the sensor, or poor connection to the reading equipment. A poorly installed sensor can also be constantly dry, with no bond to the soil allowing it to absorb soil moisture. Also see How can I check the sensors? Erratic readings are frequently the results of poor connections. Check all wire splices and connection points and ensure they are solid and waterproof. Stray current from poorly grounded equipment in the field can also cause erratic readings. If it is possible to ground the reading equipment to a common ground with the suspect equipment, this may solve the problem. Also see How can I check the sensors? "How long do the sensors last?" The expected sensor life is 5+ years. At the five year point we recommend removing the sensors and checking them. "How can I check the sensors? The only way to thoroughly check a WATERMARK sensor is to remove it, soak it in water, and then hang it out to air dry. A. With a sensor submerged in water, your meter reading should be from 0 to 5. If the sensor passes this test, go on to step B.
C. Put the sensor back in water. The reading should return to below 5 within 2 minutes. If the sensor passes these tests, it is O.K. If the sensor has been installed on the end of PVC pipe, you can do a quick check on a sensor by pouring water down the pipe. The sensor should drop to below 5 within a few minutes. "How do I install the sensors?" Soak the sensors overnight in irrigation water. Always "plant" a wet sensor. If time permits, wet the sensor for 30 minutes in the morning and let dry until evening, wet for 30 minutes, let dry overnight, wet again for 30 minutes the next morning and let dry again until evening. Soak over the next night and install WET. This will improve the sensor response during the first few irrigations. Make a sensor access hole to the desired depth with an IRROMETER installing tool or a 7/8" O.D. rod. Fill the hole with water and push the sensor down into the hole so it "bottoms out". A length of 1/2" Class 315 PVC pipe will fit snugly over the sensor's collar and can be used to push in the sensor. A good snug fit in the soil is important. This PVC can be solvent welded to the sensor collar with a PVC/ABS cement (IPS Weld-On #795 or equal). If the PVC is solvent welded to the sensor, drill a small (1/8") vent hole in the pipe just above the sensor. If the PVC pipe is not left on the sensor, then backfill the hole so the sensor is buried (see Fig. 1). The sensor's wires can easily be staked up for easy access. If PVC is left on, then compact the soil around the surface to seal off the hole (see Fig. 2). The PVC acts as a conduit for the sensor's wires. Be sure to cap off or tape the top of the pipe, so surface water will not infiltrate to the sensor and give a false reading. For very coarse or gravelly soils, an over-sized hole (1" - 1-1/4") may be needed to prevent abrasion damage to the sensor membrane. In this case, auger a hole to the desired depth and make a thick slurry with the soil and some water. Fill the hole with this slurry and then install the sensor. This will "grout in" the sensor to ensure a snug fit. Another method of installing sensors in difficult gravelly soils, or at deeper settings is to use a "stepped" installing tool (see Fig. 3). This makes an over-sized hole for the upper portion and an exact size hole (sensor is 7/8" O.D.) for the lower portion where the sensor is located. The hole must be carefully backfilled and tamped down to prevent air pockets, which could allow water to channel down to the sensor. "How does soil temperature affect the reading?" Soil temperature affects WATERMARK sensor readings by 1% of the measured resistance per 1 degree(F) temperature. If the reading equipment does not use some form of temperature compensation, it is not unusual to see some movement in the sensor reading from day to night due to temperature effects. Soil temperature changes are typically mild at depths below 12". Accurate temperature compensation requires that the temperature sensor be located at a depth that represents the temperature around the WATERMARK sensors. "Should the Irrometer be protected from freezing temperatures?" Yes, it is recommended that the Irrometer's be protected from freezing temperatures. Most susceptible to damage is the gauge. When water in the Bourdon tube of the gauge freezes, it expands causing the tube to become distorted, throwing the gauge out of calibration. 1. The Irrometers can be removed and stored in a warmer location during the winter months. 2. Removing the cap will allow the water to drain from the Irrometer body, but not the gauge. If you want to leave the Irrometers in the ground, drain in this fashion and remove the gauges for storage in a warmer location. Be sure to replace the caps and plug the gauge port. 3. Bury the Irrometers so they will stay above freezing and then unbury them come spring. 4. Cover them with a box that will provide sufficient insulation. 5. Mix no more than 45% rubbing alcohol or methanol with the fluid to create an anti-freeze solution. It will be necessary to remove the gauges to drain them of the regular water and then hand vacuum pumping to replace with the new anti-freeze solution in the instrument. If you intend to take readings during the winter months, options 4 or 5 are best. If you do not need to take readings during the winter, other options are easier. "What types of soil can I use WATERMARK sensors in?" WATERMARK sensors are designed for use in typical soil conditions, from sandy loam to heavy clay. Exceptionally coarse or loose soils like sand or potting mixes do not present good conditions for WATERMARK sensors, potentially leading to very slow sensor response. Consider IRROMETER "LT" tensiometers for these applications. Click here for the sensor selection guide. "Can I read a WATERMARK sensor with a digital multi-meter?" No, WATERMARK sensors require specific reading circuitry to read properly. "What does (insert your volumetric measurement here) equal in Centibars?" WATERMARK sensors are calibrated to represent soil moisture in Centibars (or kPa) of soil water tension, equivalent to the reading given by a tensiometer in the same soil. There is no direct comparison with volumetric measurements possible without creating a site specific calibration, as different soil types and conditions create different tensions for the same volumetric contents in different soils. "Can I read a WATERMARK sensor with my device?" The WATERMARK sensor is read as a resistance. Excitation for the sensor must be of a specific nature with very precise timing in order to produce accurate results, and the circuit must be designed to account for other factors that will affect the lifespan of the sensor. IRROMETER offers a voltage output adapter for any standard WATERMARK sensor, the 200SS-VA. This adapter wires onto the lead lines of the WATERMARK sensor and outputs a simple 0-2.8 volt scale representing 0-239 Centibars and can then be read by most devices with analog inputs. "Is the WATERMARK sensor a gypsum block?" The WATERMARK sensor is a granular matrix sensor (GMS) which in operating principle is similar to a gypsum block, but is constructed to last considerably longer, maintain Contact Tech Support: with surrounding soil, and provide better response at lower tension levels. "What soil characteristics affect the Watermark Sensor readings?" Watermark Sensors, like all electronic type moisture sensors, are affected by things that will change the conductivity of the soil water. Salinity is the typical concern and the Watermark has enough internal gypsum to buffer the effects of "typically salinity levels found in irrigated agriculture." We publish no reference as to how much salinity is too much. Certainly a newer sensor can buffer for more than an older one because gypsum does go away over time. Researchers using them for different applications have told us that effects from salinity are not usually noticed unless it is >3 dS/m. Sometimes after a fertilization event the reading may appear artificially wetter from the added salts if high but after a flush with the next irrigation cycle they will return to normal. "Which wire is the ground wire on the 200SS?" - The ridged wire is the ground wire when wired onto the 950R. - Both wires will function the same when wired onto the 900M. "How many records will the 900M data logger hold?" - The 900M Data Loggers will hold 4094 records, it will start deleting the oldest records, then add new records, when full. "How can I update the firmware on my 900M data logger?" "My data logger is displaying "open" on the display." - This code is an indication of a lose wire, a really dry sensor, or a switching gauge. "What are mesh radios or nodes?" They are radios that can relay each other's messages to a Base if they are not able to speak to the Base directly due to range or obstructions. For purposes of this document, the words "radio" and "node" are used interchangeably. "Will I need an installer?" An IRROmesh system is 'self-deploying', meaning, the radios discover each other. There is no need for specialized installation or programming skills. Simply follow the steps in the Installation and Operating Instructions to install. "How long will these radios last?" We estimate at least a six year life expectancy. "How does the data get to me?" There are three data collection devices available: 1) a Cellular Gateway, 2) a PC Link, and 3)a Logger. The Cellular Gateway sends data directly to a cloud-hosted WEB service called SensMitWeb using your local cell network. The PC Link (and Logger by option) uses a PC with Windows� software called SensMitPath to send the data to the website. The Logger uses IRROMETER's 975L IRROmesh software to download data from the Logger to a laptop for storage and display. "Why is the Base not wired to the data collection device ?" Having a free-standing Base lets you install it in the location (such as atop a tall pole) where it serves the mesh best. A free-standing Base also enables you to exchange data collection devices without affecting the ongoing operation of your system. As soon as sensor readings are taken by the radios, they are encrypted and converted into http posts. Decryption does not occur until the data is processed at the website or in the software. Each IRROmesh Node has a unique ID that is 'burned' into the radios when they are first associated with 'their' Base, preventing radios from talking to any other mesh. "What is the difference between Relay and End Nodes?" A mesh consists of a Base, a data collection device, a skeleton of Relay and End Nodes, and the Sensors you attach. Relay Nodes collect their own data and relay other nodes' data to the Base. End Nodes collect only their own data and transmit to a Relay Node or directly to the Base. "Do I need to program anything?" No. The Base builds all mesh pathways and chooses the optimal frequency sub-band for your system automatically. All you do is name the radios, input their GPS coordinates (if mapping is desired) and set any desired sensor alarms at the website. If a brand new radio is introduced to the mesh, the mesh automatically adopts it. "What happens if a link is missing - do I lose data?" IRROmesh has advanced data retention processes, so that if any communication links are missing or temporarily unavailable, the previous component retains all unsent data until the link is re-established. Data is then automatically sent up. "IRROmesh components don't have batteries - do they still work at night?" Yes, IRROmesh works 24/7 in all weather conditions. IRROmesh uses Super Capacitors instead of batteries, and advanced sleeping algorithms to manage power. A short period of full sunlight will recharge a node for over 24 hours of continuous operation. Only the Cellular Gateway has a conventional battery for the modem itself and is charged by a 5 watt solar panel. The radios use a combination of 'mesh-sleep' and 'self-sleep' to conserve power. In general, the radios are asleep during low/no light conditions, waking briefly every half hour to read sensors and communicate data. During cloudy-bright and lighter conditions, the mesh is fully awake and operating continuously. See the 'Sleeping and Non-flashing Nodes' section. "How does a time-stamp get attached to the data?" The time is introduced to the IRROmesh system via the PC used to communicate with it, or via the cell network in the case of a Cellular Gateway. "The radio's case doesn't look waterproof, can I get it wet?" The cases are rainproof but should always be mounted vertically. The components inside the cases are waterproof, but should be kept dry. "Do I need to buy custom mounting hardware?" "Do I have to use the SensMitWeb Service?" If you wish to stream data in real-time or access SensMitWeb's growing catalog of data reprocessing tools, then Yes. The SensMitWeb service gives complete access to IRROmesh functionality including system diagnostics and provision for CSV file export. "Can I send the sensor data to other applications?" Yes, for data sent to the Internet you can use SensMitWeb's CSV download function to create a file that most third-party software packages will read. Data downloaded from the Logger is configured as a CSV file by default. "How far can the radios communicate?" The nodes are rated for 1000 ft (305m) over level terrain in clear line-of-sight. Performance varies, but maximum eight hops of 1000 ft (305m) between Relay Nodes in one 'leg' can be accommodated. End Nodes are rated for 1200 ft (366m). "How many radios can I have per Base?" 20 total. You can have up to 12 Relay Nodes per IRROmesh Base, and up to three End Nodes per Relay Node. End Nodes can also communicate directly to the Base. "How close can radios be to each other?" There is no minimum distance. "Do I need to install the radios to have clear line of sight?" Range is greatly improved by installing the nodes to have true 'clear line-of-sight' (CLoS). See User Manual and Installation section to understand what CLoS means. "How many radios do I need per acre?" 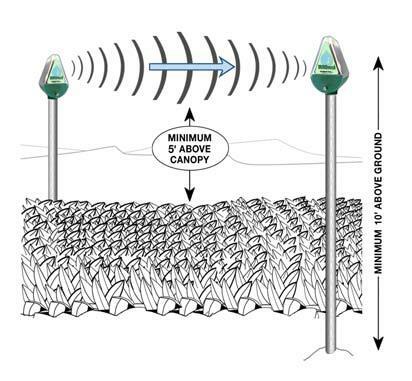 Installations range from 10 or more nodes per acre to one node per 30 acres - it depends on what you are sensing, your crop and how uniform your soil conditions/operations are. See: http://www.irrometer.com/sensors.html . for information on deploying WATERMARK Sensors. "Are the radio waves dangerous?" IRROmesh transmits at about 1/50th the intensity of your mobile phone. "Do I need a license for these radios?" No - they operate on unlicensed bands which are set at the time of manufacture as suitable for use in the USA, Australia, New Zealand, Chile or any country using the ETSI standards (EU market). They are FCC and IC certified and CE marked. "How many sensors can I connect?" End and Relay Nodes (975NR and 975NE) are configured to serve up to three WATERMARK Sensors, a Soil Temperature Sensor, a tipping rain bucket and an Irrigation On/Off switch. Each node has a sensor that transmits device-internal temperature and each node monitors and reports its internal power levels and charging rates. "How long can the sensor wires be?" Up to 1000 ft (305m) use AWG UF 18 gauge wire. 1001 to 2000 ft (305 to 610m) use AWG UF 16 gauge wire. 2001 to 3000 ft (610 to 914m) use AWG UF 14 gauge wire. "Where can I view my data?" If your data is automatically uploaded to the Internet you can access https://www.SensMitWeb.com . from any PC, Smart phone or Tablet connected to the web. If you are using the Logger, any device running a full Windows� OS (not mobile) is acceptable. "I look at my web login but it's not updating, or shows old information, or says that my mesh has not delivered any data yet when I know it has - what's wrong?" "Where do I get the Windows� applications I need to send data up to the web?" Go to http://www.Irrometer.com/download/sensmit_installer.exe . Follow the SensMitPath installation instructions. If you are just logging data to use in IRROMETER's 975L IRROmesh software, download the software from: http://www.Irrometer.com/download/975-DL.exe . "How do I use SensMitPath?" Go to 'Notes for Using SensMitPath' at: http://sensmitwebdiv.com/wp-content/uploads/2014/01/Notes-for-Using-SensMitPath.pdf . "How does SensMit connectivity work?" IRROmesh is unique in the way data is retained and transferred. Because each component of IRROmesh (except nodes) can retain months of data, each link and device is in effect a data logger awaiting download in either real-time or when the user downloads it manually. "My base runs low on power at night." Your Base may not be sleeping. At least one Relay Node is needed, otherwise, the Base does not know when to sleep. If the Base is still not making it through the night, ensure that the connection to its super capacitors is not interrupted. "I want to stream data from my Internet-enabled on-site facility -which data collection device do I need?" The simplest data collection device to use is the PC Link. It must be in sight and within 300 to 800 ft (92 to 244m) of the Base to receive data. "How does PC Link work?" When the PC Link is plugged in to a Personal Computer = PC (or any other USB power device), it will collect and store data coming from the IRROmesh Base. If plugged into a PC with its SensMitPath software running but not connected to the Internet, the data will be stored on the PC. When the PC is connected to the Internet and SensMitPath is running, any stored data will be sent to SensMitWeb, and any incoming data from PC Link will stream to the website in real time. "I plugged in my PC Link but nothing is happening." It can take up to an hour for the PC Link device to charge up the first time it is installed. "I want to stream data from a remote location - what do I need to order?" You would need a Cellular Gateway. Work with your IRROmesh provider to determine the best option for you. DO NOT Exchange the SIM card that comes with the Cellular Gateway for another - it will not work. "Which PC do I use for PC Link and Logger download?" You can use any Windows� based PC or a tablet using a full Windows� version (not Windows� Mobile). If you are streaming data, ensure the PC's automatic sleeping feature is disabled completely and that SensMitPath is placed in the PC's Auto-Start Menu so it can recover after automated Windows� updates and power interruptions. Instructions are at http://SensMitWebdiv.com/resources/ . Your computer's anti-virus software and firewall protections may not allow SensMitPath software access to the Internet. They must be configured to allow access through the firewall, usually by adding SensMitPath to the 'exceptions' list of the security program(s). Most firewalls support SensMitPath access, but some may corrupt the postings and create transmissions errors, showing 400 series error codes in the SensMitPath display window. "When should the Logger be used? Non-real-time systems that use the Logger are for cases where there is no web-connectivity on site or if your preference is to manually collect and store your data. EXAMPLE: Download times for a system with 12 nodes, from the Logger to laptop, can take about one minute per day of data. "How do I start my Logger?" After the Logger is fully charged and associated and before installing the Logger in the field, connect it to your computer. Initiate IRROMETER's 975L IRROmesh software at http://www.Irrometer.com/download/975-DL.exe . Once the program is loaded and running, click 'Find SensMit' and wait until the time at the bottom left of the software's pop-up window shows the hours and minutes and seconds in your local time. The displayed time in the program's dialogue box must match your computer time before you disconnect the Logger's USB plug. The Logger is now ready to put in the field near the Base. "How do I download my Logger? While in the field at the Logger location, download the Logger by first starting 975L IRROmesh software or SensMitPath on the computer being used in the field. Plug in the Logger's built-in USB cable. If it does not auto-find your data, click the 'Find SensMit' button. Alternately, first plug in the Logger's USB and then start the program. You may need to click the 'Find SensMit' button or unplug and re-plug the Logger's USB cable if the download does not start automatically. You will know the download is complete when you see "Nothing to Post Zzz..." in the program's dialogue box. Logger is meant to be downloaded in the field to a laptop or full Windows� version tablet with a USB port. The laptop's/tablet's time is carried by the Logger to the mesh if it is left turned on after downloading and then sees the Base. Otherwise the mesh time will prevail. The Base always sends the Logger any data it has stored, so the Logger does not miss data if it is taken from the field for a period of time. When brought back to field, the Base will send all data since the Logger left. "My PC Link or Logger is properly connected and SensMitPath is running but it's not finding the device." 1. Make sure you only have one version of SensMitPath or 975L IRROmesh software running. 2. Click the 'Find SensMit' button and wait for a minute. If that does not work a driver may be missing. The cable that connects the Logger or PC Link to your PC needs a special driver that does not always install automatically. Go to: http://www.ftdichip.com/Drivers/VCP.htm . to download the driver, and follow the installation instructions. "My Logger has downloaded, so where is the data now?" The data is stored in a file called logger.BZXXXXXX.csv, where 'BZXXXXXX' represents the Logger ID number. You can find it in the same directory on your computer as 975L IRROmesh software or SensMitPath. If you are using 975L IRROmesh software the data is stored as a CSV file and can be displayed by clicking on 'Graph 975L Data File' on the 975L software opening screen, or exported into any other application that supports CSV format. If you are streaming data to the website, the post file's data will automatically be sent up to the site by SensMitPath, which must be running, where it will be decrypted and displayed. "Why does my Data not get sent to the WEB as soon as it is collected - I have to wait as long as 10 minutes for it to appear?" Data upload times are staggered to reduce traffic jams in the data flow to the website. "Can I change how often the data is collected?" No. The data collection and storage interval is currently fixed at 30 minutes. Data is reported to the SensMitWeb site every 30 minutes while the mesh is awake, and once an hour when it is asleep. "Can I send data to other applications?" "What does the sensor data mean?" Our website http://www.irrometer.com/. 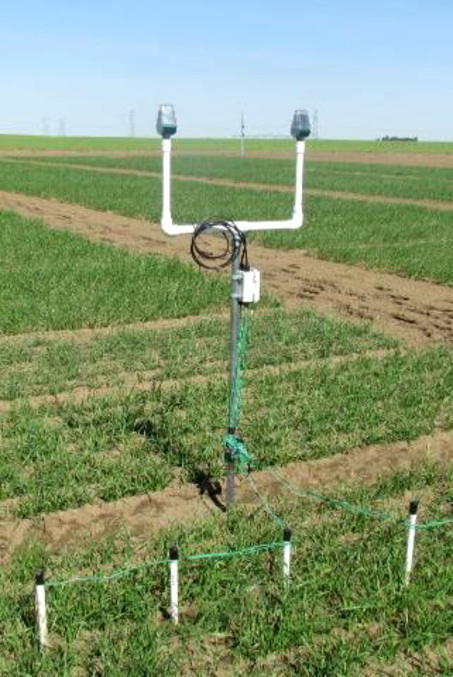 provides complete information on using WATERMARK Soil Moisture Sensors. Each node's internal temperature sensor gives the temperature inside its case. In general, the night-time temperatures given are similar to adjacent air temperatures minus wind effects. Daytime temps shown are 'greenhouse' temperatures and will usually be a lot higher than the outside air temperature. "Where can I find an installation manual? Each IRROmesh system is shipped with Installation and Operating Instructions. Loggers are shipped with their own user manual. They can also be downloaded from http://www.irrometer.com/downloads.html#975. Irrometer.com/downloads.html#mon at the 'IRROmesh Instruction Manuals' dropdown. "What does an IRROmesh installation look like?" "How do I design my mesh layout?" Your supplier may provide a design service for you. You can also do it yourself - read ALL the steps before starting. 1. Get a satellite or Google Earth� image on paper of your site in a known scale. 2. Make one circle template that represents 1000 ft (305m) radius = 2000 ft (610m) diameter and one circle template that represents 800 ft (244m) radius = 1600 ft (488m) diameter in that scale. The 800 ft radius circle is the design range over which the first ring of radios communicate. 3. Pick a location for your Base - ideally, as near the site's center as possible for the Logger or Cell Gateway devices, or within 800 ft (244m) of your PC Link. 4. Use the 800 ft circle template to pencil the range around the Base. The first ring of Relay Nodes must be placed at least in that circle. Draw a circle around the new Relay Node with the 1000 ft radius template. It is fine, and in fact preferred, if circles overlap! 5. Move outwards from the Base's circle and continue drawing circles for Relay Nodes building a 'skeleton' until you have reached the edges of the whole site - you can have 12 Relay Nodes per Base. Make sure that there are at least two routes from each Relay Node back to the Base. 6. If there are any other areas where you want a sensing station, put End Nodes in to fill in the gaps. There can be three End Nodes per Relay Node, not to exceed 20 total nodes per Base. Nodes must have clear line-of-sight to perform well at maximum range. "What does clear line of sight look like?" Nodes must have clear line-of-sight to perform well at maximum range.They must be 8 ft to 10 ft (2.5m to 3m) above the ground and at least 5 ft (1.5m), above the final crop height, for maximum range. See the diagram (left) for horizontal clear areas. There should be no obstructions between the nodes, behind the nodes, or above the nodes. "What do 'Associate' and 'Join' mean in IRROmesh language?" Associate means to link a device unique ID with the unique Base ID that defines each IRROmesh system. This is a semi-permanent action that prevents the device from speaking to any other Base. Join applies to a previously associated device connecting to either the Base or another node of 'its' mesh. "What do the light flashes of a Normal Node look like?" 1. During data collection/transmission - you will see the green light flashing continuously and an occasional amber flash. 2. For a sleeping node - you will see some brief green flashes every 30 to 60 minutes. 4. When the Logger is being locked out by 975L IRROmesh software - the red light flashes on a two second interval. Unassociated - this node has not been associated with a Base yet and is trying to find a Base with which to associate. You will see repetitions of the red, amber and green cycling, and then the red and amber flashing together. Once it has associated with the Base, the green light will flash and pulse. Seeking - this node has been associated with a Base before, and is now trying to join the mesh. You will see just the red and amber flashing together, and some non-flashing times as the unit waits to retry the join. Start-up - this sequence shows a node that has either just reset or whose increasing voltage has just enabled it to start up. You will see the red, amber and green lights scroll for a few cycles, and then see the red and amber lights flash together until the Base is found. Then you will see the green light start to flash. "No lights are flashing on my node - is it working?" No lights mean either the device is completely de-powered, though more likely, it is either resting in between attempts to rejoin the mesh or it is asleep. If it is resting, it will try to rejoin the mesh every 10 minutes. If it is asleep, it may not show any lights for up to one hour. "Do the nodes' solar panels have to be in full sun?" Cloudy-bright conditions are enough for nodes to manage all charging and operational processes. For Relay Nodes, it is best that one panel is in full light as often as possible. When even one Relay Node of a whole system doesn't have either panel in full-light the whole system can go to sleep. For End Nodes, it is fine if the panels are not in full light. "How do I install my mesh?" 1. 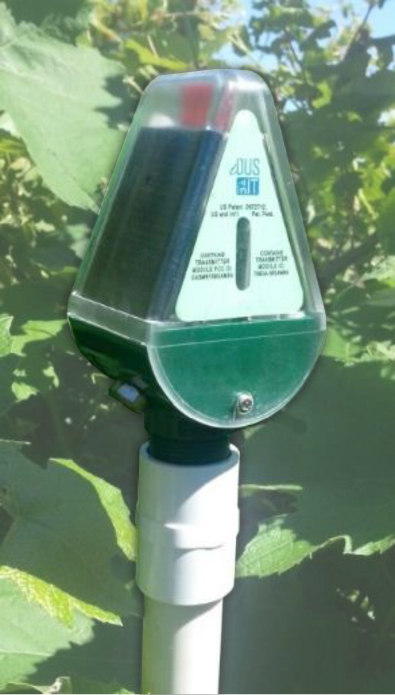 Start charging Base in bright conditions - once green light is flashing and data collection device (see below) has joined, turn the Base off by sliding the switch inside the capacitor housing to 'OFF' and covering the solar panels so they do not get any light. -- a.Logger - need to associate and join - start charging at the same time and right beside the Base until red and amber lights are flashing together on intervals (you will also see all three lights rippling on and off intermittently) and then flashes green or it goes to sleep. -- b.Cellular Gateway - need to associate and join - turn on and verify that red light on the modem itself is flashing once per two seconds. Verify that red and amber lights are flashing together on intervals (you will also see all three lights rippling on and off intermittently) and then flashes green or goes to sleep. -- c.PC Link - need to associate and join - leave plugged into a PC or USB power source for an hour or more to fully charge and start looking for the Base. Verify that red and amber lights are flashing together on intervals (you will also see all three lights rippling on and off intermittently) and then flashes green or goes to sleep. 3. Place all Nodes within 2 ft (60cm) of each other in the sun and let them charge until red and amber lights are flashing together on intervals (you will also see all three lights rippling on and off intermittently). NOTE: There can be intervals of up to five minutes between light flash sequences. 4. Bring the un-powered Base within a 2 ft (60cm) range of the nodes, turn the Base on and leave all together for an hour or less until all nodes are flashing green, have flashed green, or have flashed green and turned off (evidenced when they do not flash for five minutes, sleeping). 1. Install Base first, then the data collection device. 2. For fastest first transmission of data, take the nodes to their final destination one at a time, starting with the one closest to the Base and working outward. If nodes are placed in random order initial reporting will be delayed. 3. Install sensors on nodes once all nodes are reporting. "My node's lights are not flashing, or none of the mesh's lights are flashing - is something wrong?" It is likely asleep. The nodes use a combination of 'mesh-sleep' and 'self-sleep' to conserve power when they are not in medium to bright light conditions. In general, the radios are asleep (no lights flashing most of the time) during low/no light conditions, waking briefly every half or full hour to read sensors and communicate data. "The whole mesh is awake but my Logger is asleep - is this normal?" Yes, it sleeps most of the time. The Logger's lights come on when you start the download process. "This node is getting lots of light - why is it not awake and flashing?" 1. The charging system in one of the mesh's routing nodes might not be getting enough power to stay on full-time, which can put the whole mesh to sleep until the next half or full hour. 2. A node just used most of its power to join the Base, resulting in the whole mesh going to sleep. 3. This node could be trying to re-join the mesh, and is sleeping for 30-360 seconds (usually) or up to 16 minutes between tries depending on conditions before trying again.